Video courtesy of THOR Photomedicine Ltd. 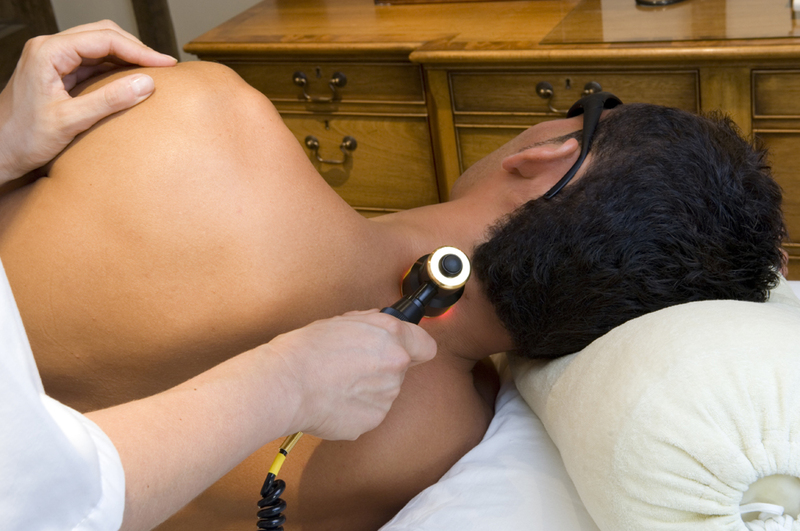 Neck Pain treatment with Laser Therapy. Courtesy of THOR Laser. Cold Laser Therapy, also called Low Level Laser Therapy, uses light energy from the visible and infrared spectrum to produce a series of photochemical reactions that result in tissue healing, pain control and the stimulation of the vascular, lymphatic and immune systems. It has a cumulative effect in cells and tissues. Back Pain Treatment with Laser Therapy. Courtesy of THOR Laser. Our laser therapy is delivered directly through the skin, using infrared laser and LED probes, with appropriate protocols, without any side effects. Cold Laser therapy improves tissue repair, reduces pain and inflammation. It is effective in treating many conditions such as neck and back pain, sciatica, fibromyalgia, osteoarthritis, tendonitis, carpal tunnel syndrome, plantar fasciitis, sports injuries and others. Many professional athletes utilize laser therapy to reduce healing time and get back into the game in as much as 3X faster and without the use of drugs. Many people are using laser therapy to eliminate dependence on pain medications, avoid surgery, relieve pain, and return to a healthier lifestyle. Although more recently approved in the U.S. by the FDA, Laser Therapy has been used for almost 40 years worldwide, as well as by NASA, US and British Military, Harvard Medical School, Olympic teams, premier division football teams, and pain clinics. 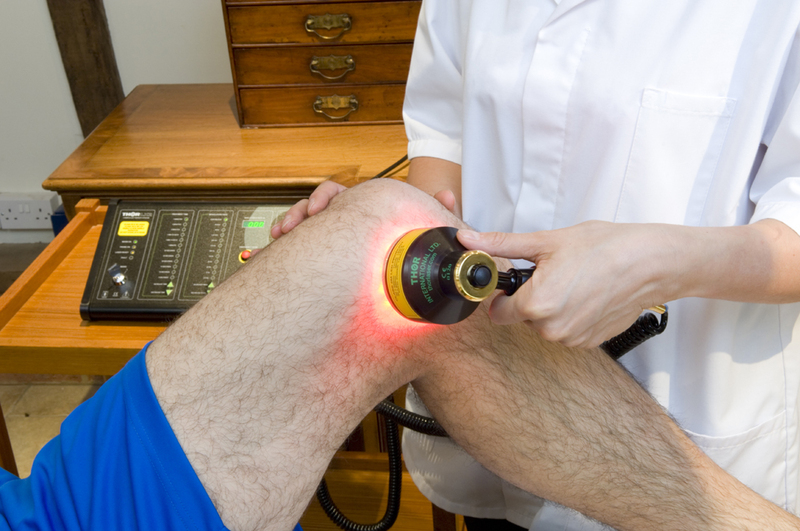 Knee Pain Treatment with Laser Therapy. Courtesy of THOR Laser. Most recently, several Olympic teams have been using our THOR laser at the London Olympics, including athletes representing the USA, Great Britain and Australia. Laser light stimulates cells to repair tissues, reduce inflammation and inhibit pain. The application of specific wavelengths of red or near infrared laser or LED light on acute injuries and degenerative conditions relieves pain and improves healing. Laser works by reducing oxidative stress and increasing production of ATP, as well as by inhibiting fast axonal flow in C and A delta fibers, which causes a temporary neural blockade, reducing central sensitivity. Patients typically experience reduction in pain and increased range of motion immediately after the first treatment. It can take as little as three treatments for acute conditions, or as much as a dozen sessions for chronic ones. Cold Laser Therapy has the advantage of having no side effects, unlike many drug therapies. Laser Therapy has been used for Pain Reduction, Smoking Cessation, Weight Management, Stress and Anxiety Control, Alcohol and Drug Addiction, and Cosmetic Rejuvenation Acutherapy. Please call 732-462-0909 for a free consultation or to make an appointment. Not Finding your Specific Pain?